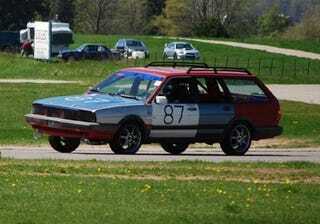 Is it possible for a $300 Volkswagen Quantum Syncro to survive all weekend in a road-course endurance race? No. How about taking 9th place overall, in front of E30s, RX-7s, Integras, and other allegedly faster cars? Again, and emphatically, no. Yet the Team Chicken & Waffles Quantum accomplished both those feats, and for this they have received the 24 Hours of LeMons' highest honor: The Index of Effluency. Not only that, but Chicken & Waffles was staffed by the likes of Car And Driver hack Mike Austin, Automobile hack Phil Floraday, Ford flack Patrick Hespen, regular working stiff David Furchak, and Cadillac flack Nick Twork. Yes, automotive journalists and auto-industry PR dudes can accomplish great things, given the proper venue. Congratulations, Team Chicken & Waffles! It's a proud day for all of the world's 127 Quantum Syncro owners.